Photo Credit: Dave Gates on November 7, 2009, downtown Portland, Oregon, USA, via Creative Commons License through Flickr. The photographer does not necessarily endorse the views expressed in this article. Then we’d inevitably stop by the hardware store, swing over to the drive-thru car wash, and end up at the supermarket. Once we’d made our selections, we’d steer the cart into the aisle and start loading our items onto the conveyor belt. Meanwhile, we’d make guesses as to the total amount we (mom and dad) were going to end up spending that day. As a kid, I never wondered how many items in our cart were from local farmers, food processors and vendors. It never crossed my mind to ask if we had made organic dairy, meat and produce selections. Did the concept of “organic” food as it pertains to fruits, vegetables, grains, dairy and animal protein even exist in those days? Certainly, farmers, scientists, lobbyists, and pesticide and herbicide salespeople were quite familiar with the concept, but it is probably safe to say it just wasn’t on the general public’s radar at that time. As I embark on the vast and wonderful journey that is environmental sustainability – as a consumer, graduate student and Analyst in sustainability consulting – I am struck by a newfound awareness of all things organic and sustainable and those that are mass produced, processed and pumped full of chemicals, in the realm of food and food products. Why newfound? I’m a part-time graduate student pursuing a degree in Environmental Management and Sustainability. Although environmental sustainability has been on my radar since I was a kid, only recently have I started to make food choices based on my awareness of the agribusiness. My new and growing awareness is coupled with an overwhelming sense of guilt. Why? Because I’ve been eating “irresponsibly” for so many years, initially without knowing it and later using my small pocketbook as an excuse. These days, going to the grocery store is somewhat less of a treat than it was when I was a blissfully unwitting child, happily roaming the aisles with my dad and our clanging shopping cart. Still, I find myself dazzled by the bountiful array of choices, the smells, the talking misters, and the people watching. In my urban neighborhood, and in big cities all around the world, the food choices, even during the non-growing season, are endless: strawberries from California, avocados and tomatoes from Mexico, and clementines from Spain. Certainly, having myriad options, especially on a cold winter’s day, is fun. Are the strawberries less juicy in December? Yeah, but sometimes a berry on a bleak, winter day makes you hopeful that spring won’t forget to return. Grapefruit is at its peak from January to June in Arizona and California. Does that mean that we folks in the Midwest and other parts of the country (and the world, for that matter) should be deprived of the tangy citrus fruit because we live too far away for it to be called “local” or “regional” produce? Here’s where the pesky awareness, social consciousness, and guilty feelings come into play. Imagine your average grocery store as it is today: displays filled with colorful, shiny produce; shelves stacked high with the best cuts of chicken, beef and pork; aisle upon aisle of flashy boxes of cereal and canned goods; and freezers filled with easy, cheesy, ice-creamy goodness. Now take away all the fruits and veggies, all the pizzas and prime cutlets of pork, and all the fancy cereals and soups that aren’t local, organic or sustainable. Looks as bleak as a howling winter’s day in Chicago, right? Some might say the answer is to be “less bad,” but most food and sustainability experts, would argue against that approach. For example, smoking fewer cigarettes is “less bad” and wearing your seatbelt a couple times a week is “less bad” than not at all, but is that the way we should live our lives? Probably not. Others might say there’s a simple solution: Choose only foods that fall into the most stringent local, organic and sustainable categories. For those of us on a tight budget or with limited accessibility to stores with sustainable food options, this solution might be presumptuous. At this point, it’s important to tap into our resources. First, we should decide what kinds of commitments we’re going to make concerning our food choices: Some/most/all organic, some/most/all local, etc. Second, we should research our options to locate the grocery stores, farmer’s markets, specialty stores, and Community-Supported Agriculture (CSA) programs that are accessible to us. Third, we should grab our wallets and coupons and start to explore our neighborhood grocers. Instead of running to the store to race in and out in our usual harried fashion, we can budget in an extra 20 minutes to peruse the organic offerings. We can even go with a friend or family member to make the experience more enjoyable and interactive. In exploring our options, we can start to incorporate local, organic food into our weekly purchases and determine which brands and markets we like. Talking with friends, neighbors and vendors will also help us identify all our options. We can look into growing our own food, whether we have a small backyard, access to a community garden, or live in an apartment with a south-facing window. Then, to prepare for the winter months, we can also experiment with freezing, canning and root-cellar storage options so that we have nearly-fresh produce options for the non-growing season. As we explore our options, we might choose to designate 20% of our food purchase to local, organic and sustainable produce, grains, dairy and animal protein. Once we acclimate our minds and pocketbooks to this approach, we can ramp up our local and organic purchases to 40%, 50%, %65, 90% and eventually 100%, where making sustainable food choices becomes the standard, instead of a mental, moral or financial strain. Sustainability doesn’t have to be a pain. Voting with our forks and our credit cards are effective ways to bring about change in the agribusiness – the vast network of consumers, farmers, food processors, suppliers and vendors. The author is an analyst for Do Well Do Good, LLC, which partners with companies and nonprofit organizations whose leadership wishes to increase the positive impact of their sustainability, cause marketing, and philanthropy initiatives. Do Well Do Good, LLC provides the tools and enhances the skills of program managers in order to implement a clear and comprehensive strategy, improve communication between internal and external audiences, and integrate programs throughout all levels of the company. For more information visit http://www.DoWellDoGood.net. Great article! I agree with Ms. Whitmore; ease into buying organic if cannot afford to all of a sudden go 100% organic. It seems much more expensive at first, but when you realize that the quality, taste and health benefits of organic outweigh the convenience and low-cost of dairy, produce and meats raised with chemicals and other unhealthy additives, that extra fifty cents a pound for potatoes or a dollar for tomatoes doesn’t seem so bad. I know I shop the sales at my local food co-op and buy meat when it is on sale and freeze it. Join in with friends and buy a cow from a free-range local farmer and the cost for meat per pound is less than the commercially processed meat you buy at your Super Walmart. 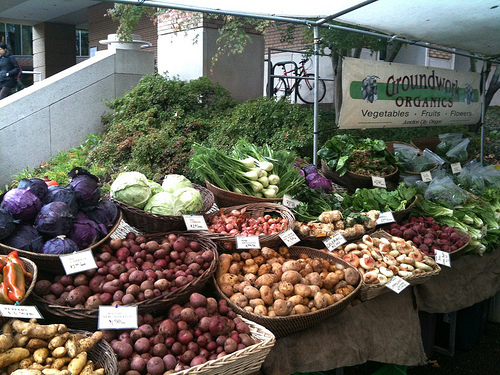 As a resident of Milwaukee, Wisconsin, I am lucky to live in a community where sustainability is at the forefront of our city government’s agenda and where farmer’s markets thrive and grow larger every year, small sustainable businesses are popping up everywhere and a huge victory garden initiative has been in swing for years. Thanks for inspiring people to get a little more local and organic! I couldn’t agree more with the author. There are many excuses for making poor decisions at the checkout counter. But I too have recently chosen to eat more responsibly in the new year. Well, I’ll start with being “less bad” and hopefully I can build upon that. I wish everyone luck in their journey towards a healthier, more sustainable diet!